Welcome to the Classic Folios privacy notice. Classic Folios (we) are committed to protecting and respecting your privacy and complying with the General Data Protection Regulation (GDPR). Looking after the personal information that you share with us is very important, and we want you to be confident that your personal data is kept safely and securely. It is important that you read this privacy notice, together with any other privacy notice or fair processing notice we may provide on specific occasions when we are collecting or processing personal data about you so that you are fully aware of how, and why, we are using your data. This privacy notice supplements the other notices and is not intended to override them. Classic Folios is the controller and is responsible for your personal data, collectively referred to as "we", "us" or "our" in this privacy notice. · Identity Data - includes first name, last name, title, job title and business company name. · Contact Data - includes billing address, delivery address, email address and telephone numbers. · Transaction Data - includes details about payments to and from you and other details of products and services you have purchased from us. · Technical Data - includes Internet Protocol (IP) address, your login data, browser type and version, time zone setting and location, browser plug-in types and versions, operating system and platform and other technology on the device(s) you use to access this website. · Profile Data - includesyour username and password, purchases or orders made by you, your interests, preferences, feedback and survey responses. 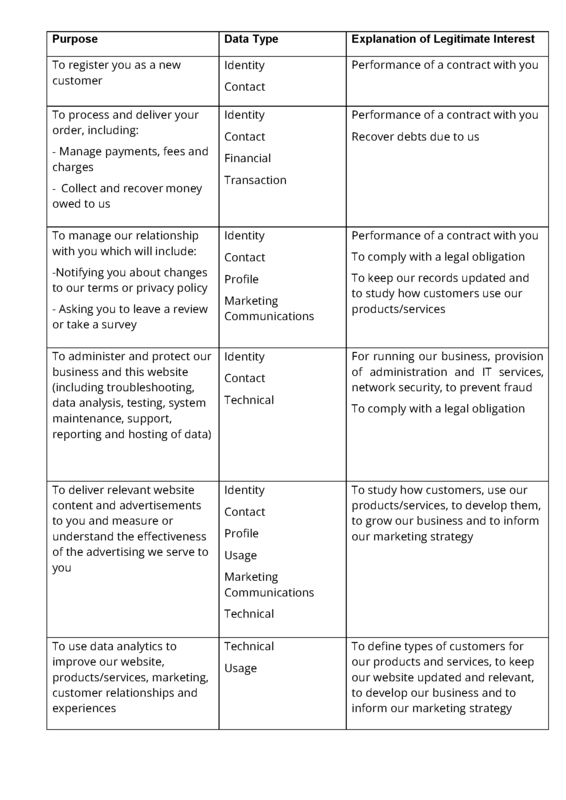 · Usage Data - includes information about how you use our website, products and services. · Marketing and Communications Data - includes your preferences in receiving marketing from us and our third parties and your communication preferences. o Identity and Contact Data from a business partner, such as property developers from whom you purchased you home, to deliver our contract for our service with them. Based inside the EU. o Identity and Contact Data from data brokers or aggregators, such as Barbour, ABI based inside the EU. o Identity and contact data from social media sources, such as LinkedIn, based outside the EU. · Where we need to perform the contract or we are about to enter or have entered into with you. You will receive marketing communications from us if you have requested information from us or purchased goods or services from us or if you provided us with your details when you requested information via our website, and, in each case, you have not opted out of receiving that marketing. You can ask us to stop sending you marketing messages at any time, by following the opt-out links on any marketing message sent to you or by contacting us at any time. · Delivery Partners: In order for you to receive your goods, we work with a number of delivery partners. We only pass on the information required to ensure the delivery of your goods. · IT Companies: We work with companies who support our website and IT systems. · Payment Processing: We work with trusted third-party payment processing providers in order to securely take and manage payments. · Marketing Companies: We work with marketing companies to help us manage our electronic communications with you. · In certain circumstances, we may be legally required to share certain data held by us, which may include your personal data, for example, where we are involved in legal proceedings, where we are complying with legal requirements, a court order, or a governmental authority. Some of our suppliers are based outside the European Economic Area (EEA) so their processing of your personal data will involve a transfer of data outside the EEA. · Where we use providers based in the US, we may transfer data to them if they are part of the Privacy Shield, which requires them to provide similar protection to personal data shared between the Europe and the US. For further details, see European Commission: EU-US Privacy Shield. · In the event that any of your data is to be transferred in such a manner, you will be contacted in advance and informed of the changes. When contacted, you will, be given the choice to have your data deleted or withheld from the new owner or controller. By law, we have to keep basic information about our customers (including Contact, Identity, Financial and Transaction Data) for six years after they cease being customers, for tax purposes. For marketing information, we retain the information about your marketing preferences until you ask us to delete this information.